What is the difference between a tuxedo and a suit? The primary physical difference between a tuxedo and a suit is the presence of satin. Traditionally tuxedos have satin facing on the lapels, buttons, pocket trim, and a satin side stripe down the leg of the trousers. Suits don’t incorporate any satin and usually have either plastic buttons or buttons faced with the same fabric as the coat (aka self buttons.) Some modern tuxedo options have minimized the use of satin to a thin satin trim on the lapels and a thin satin bead down the pant leg, but the primary difference between the two is that tuxedos have satin on them and suits don’t. Of course, to every rule there are exceptions. Other physical differences like appropriate accessories generally only come into play when talking about traditional black tie standards. For most modern tuxedo functions like proms and weddings, the lines between what is appropriate to wear with a tuxedo vs. suit have been blurred. It’s common, though increasingly less so, to wear long ties and high stance vests with tuxedos. However, this is traditionally a look only appropriate with suits. 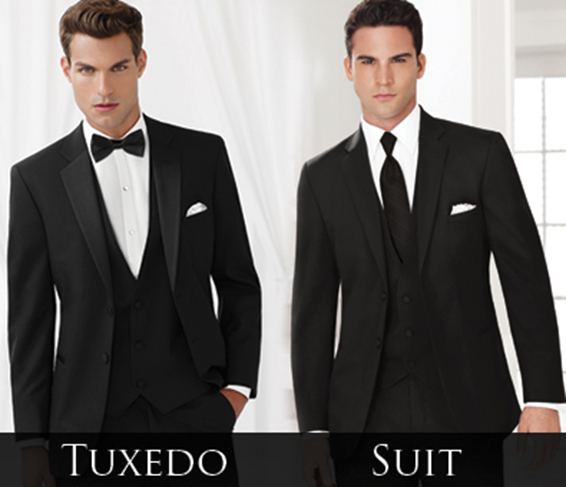 Tuxedos are historically only to be worn with bow ties and cummerbunds.